Medieval Monday with guest Ashley York & a Giveaway! It’s week twelve of Medieval Monday and our First Encounter theme. It’s my pleasure to welcome back my guest, Ashley York. 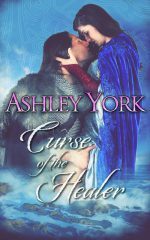 Today, Ashley has a snippet from her novel, Curse of the Healer. Don’t forget to leave Ashley a comment here on my blog to be in the running for this theme’s giveaway. The winner will be randomly chosen at the end of this theme. Read on and enjoy! A kiss? Heat poured off him, but it was no longer anger riding him. She forced down the lump in her throat, holding his intense gaze as her thoughts raced. She had never been kissed by a man. Or kissed a man, but it was not a high price to pay to dismiss the entire incident. Refusing would certainly result in a steeper demand, and the last thing she wanted to do was to cause any problems for her ri túath and cousin. Sean acted as her father, so any honor price demanded or paid could be half his worth. You can read my excerpt this week of FOR ALL OF EVER on Ashley’s blog here. Don’t forget to leave me a comment to be in the running for our giveaway. Thanks for stopping by my blog today! It does sound fabulous, doesn’t it?!? I loved the story. Ms. York writing is top notch. Aednat is wise in agreeing to the terms of a kiss. She is correct in thinking that the demand could have been worse. This book sounds interesting. I’m adding it to my to-read list. Thank you for passing my blog post on to your readers. We appreciate your support! Loved the post… the names are so intriguing & the cover is stellar!